1. On the morning of the Hunger Games, Katniss finds what as a present from Prim? 2. Never one to shy away from attention, Effie Trinket loves to intone her motto for the games, "May the odds be ____ in your favor!" 3. Representatives from how many districts participate in the Hunger Games? 4. How many tributes get sent to the Hunger Games from each district? 5. Which girl's name is read from the drawing for the tributes from District 12? 6. What is Haymitch's advice to Katniss and Peeta, both on the train and before they enter the arena? 7. Who gave Katniss the mockingjay pin to wear as her token from home? 8. It is implied that Peeta's mother hit him hard enough to leave a black eye when Peeta gave Katniss what? 11. In a show of defiance, Katniss weaves what into Rue's hair? 12. Peeta inadvertently kills Foxface by harvesting these berries and leaving them with the rest of his and Katniss' food. 13. District 11 sent this to Katniss in recognition of her partnership with Rue. 14. What do Peeta and Katniss do during the opening ceremonies that is unusual? 17. When there are six tributes left, what surprise announcement is made in the arena? 18. Who saves Katniss from Clove? 19. 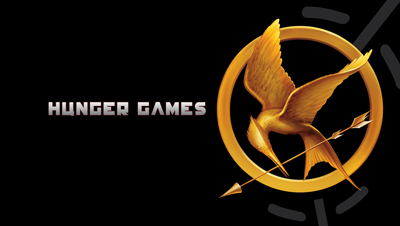 What was another name for Katniss while in the Capitol during the opening ceremonies? 21. The sponsors send Katniss and Peeta what meal, a favorite of Katniss's? 24. Who continues to provide food for Katniss' family while she is in the games? 26. When does Peeta realize that Katniss is not completely in love with him? 27. Who was the last tribute in the arena with Katniss and Peeta? 28. With what you know of Panem and current United States geography, it would be most correct to place the Capitol nearest to which contemporary city? 29. Which correctly matches a tribute to the District he or she represents? 30. Which correctly matches the District with its chief product?